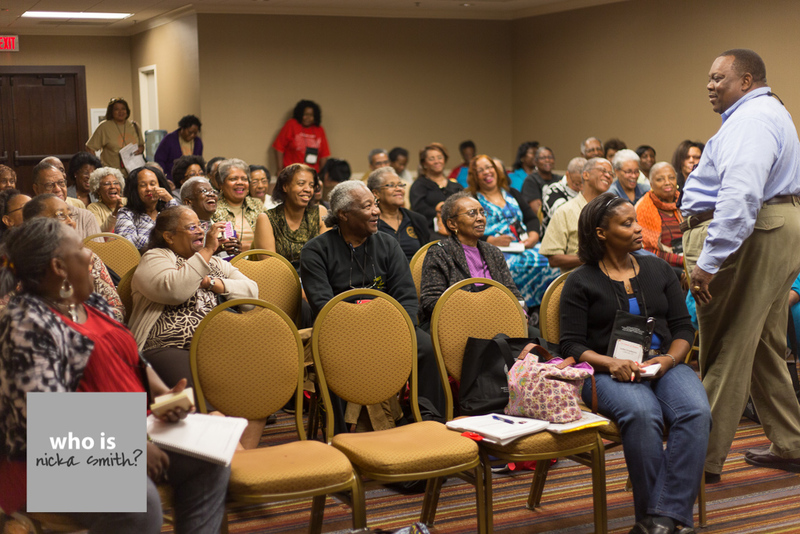 200+ researchers and family historians focused on african american genealogy descended on music city/nashville,tn from October 10-13, 2013 the 34th AAHGS conference. 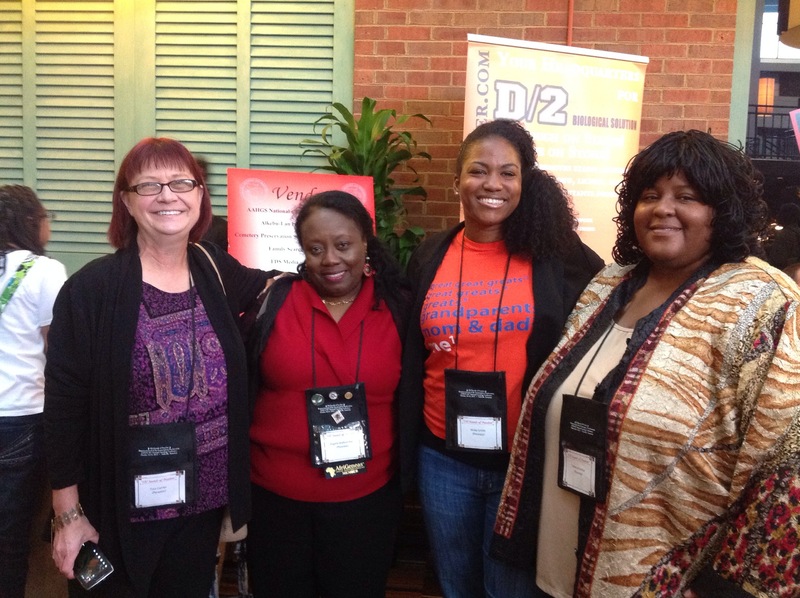 pictured above: Toni Carrier, Angela Walton-Raji, me, and Taneya Koonce. photo credit: Taneya Koonce. 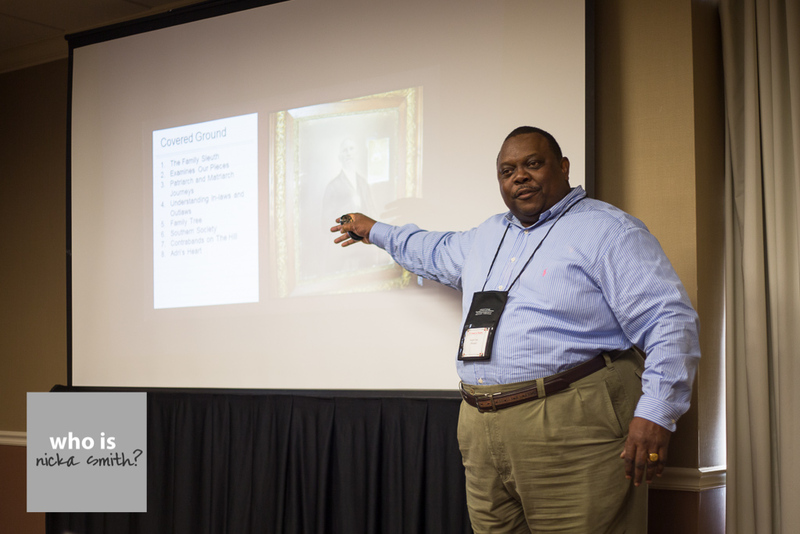 last week, i had the honor of being one of the many esteemed speakers at this year’s AAHGS conference. the theme was 150 sounds of freedom, which commemorates the sesquicentennial of the Emancipation Proclamation (EP)*, which was issued by Pres. Abraham Lincoln in january 1863.
this was my first ever AAHGS conference and i had a really good time. president tamela tenpenny-lewis, the leadership of AAHGS, and the Nashville chapter did a great job coordinating all the sessions, speakers, event space, vendors, and more. my sessions were FUN! i had a packed house and ran out of business cards and promo materials. it’s great as a speaker when you get great energy from your workshop attendees. i’ve been receiving email and social media kudos since the event, so it looks like i didn’t do so shabby. lol i also got a chance to meet some new genealogy buddies like Toni Carrier and Taneya Koonce (who is a my dna cousin by marriage), and reconnect with my buddies Angela Walton-Raji and Shelly Murphy. AAHGS Memphis/Mid South in the house! i got a chance to FINALLY meet members of AAHGS Memphis and Mid South, which is now my new home genealogy chapter. i’ve been so busy traveling this summer that i am now just able to come to meetings. meeting everyone was one of the highlights of my experience at the conference. it’s refreshing to know that i am great hands like i am with my folks in oakland. “Researching Abandoned Cemeteries” presented by Jo Ann McClellan got me re-engergized to continue the work i’ve started on cemeteries in East Carroll Parish, LA (home of my maternal ancestral roots). Dwight Fryer from AAHGS Memphis was definitely my favorite speaker at the conference. i attended both of his sessions which were titled “Unlocking Memphis History : An Inclusive Look at the Colorful History of Tennessee’s Largest City” and “Unlocking Our Southern Mosaic: Examining A Family’s Life Near Its Slavery Origins.” he is HILARIOUS and super knowledgeable about what he calls Tennessippi or West Tennessee. his research and knowledge will come in handy for me as i go further in the hubs ancestry in hardeman, fayette, and haywood counties. while the Emancipation Proclamation (EP) is believed to have ended slavery, this is in fact not the case. it only freed slaves in locations that were under confederate control, meaning those that were not already taken over by the Union. furthermore, it changed the intent of the Union to make the Civil War about creating a union where slavery did not exist. ancestors who were enslaved by the five civilized tribes (cherokee, choctaw, chickasaw, creek/muscogee) were not subject to the EP since those nations operate as their own country geographically situated within the United States. (check out this post about mine) later, treaties between the US government and these nations would free those slaves. while the EP was issued in january 1863, slavery and involuntary servitude (except in the case of punishment for a crime/imprisonment) were not outlawed until december 1865 with the 13th Amendment, almost three years after the EP was issued. for measure, former slaves weren’t granted U.S. citizenship until july 1868 (14th Amendment) and african american men weren’t granted the right to vote until february 1870 (15th Amendment).